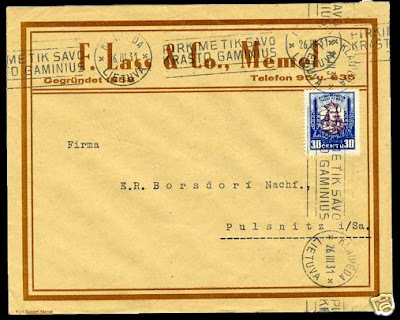 Cover from Klaipeda (Memel) to Germany dated 26 March 1931. Lithuanian domestic rate of 30 c. The domestic rate to Germany was allowed until 1936. Slogan cancellation "pirkime tik savo krasto gaminius" (only buy products of our country). No markings on reverse.